We offer you widest variety of hand-embroidered , viscose, semi pashmina, silk shawls, stoles, scarves from Kashmir in exclusive traditional designs made by best artisans. Decorated by Floral and Abstract Pattern, this warm Black and Brown Pure Kashmiri Wool shawl offers a different look this winter. The Shawl comes with a Soft Tassel Edge. Wrap it, drape it or simply wear on one shoulder for a trendy look. These shawls are the best to put on with any garment. Extremely light to carry, these shawls can be easily folded and couched in your purse when not required. A must buy for every women. 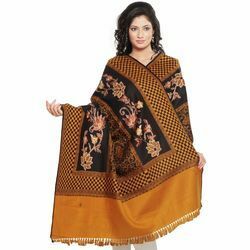 Wear this cozy Pure Kashmiri Black and Mustard Wool Shawl to keep warm in inclement weather, or just to make a fashion statement. With attractive Checkered Pattern and all over Jaal Design with Beautiful Floral Embroidery, this stylish accessory can be worn with a variety of outfits. The Shawl comes with a Soft Tassel Edge. Wrap it, drape it or simply wear on one shoulder for a trendy look. Extremely light to carry, these shawls can be easily folded and couched in your purse when not required. A must buy for every women. A must-have for the chilly season to wrap or wear it on one shoulder, this Maroon Pure Kashmiri Wool shawl with Floral Embroidery is a true piece of craftsmenship. This Floral and Paisley Design woven Shawl creates an Eclectic look to your overall persona. The Shawl comes with a Soft Tassel Edge. Wrap it, drape it or simply wear on one shoulder for a trendy look. These shawls are the best to put on with any garment. Extremely light to carry, these shawls can be easily folded and couched in your purse when not required. A must buy for every women. This fabulous feather-weight Maroon Kashmiri Reversible shawl in Checkered pattern is for stylish person like you. It is blended with Cashmilon and Wool ruffle yarn to produce cost effective product. The yarn used is very soft against the skin. Light weight and very warm, gives you look and feel of 100% Kashmiri Shawl. This Bold Abstract Design Printed Multicolor Wool Blended Modal Silk Kashmiri Reversible Stole is sure to make you feel extra special. The Abstract Designed border gives a trendy feel to this Glossy Finish Stole. The stole is tasseled for that fun feel and its gives a great look to the stole. This stole is made from Modal Silk Fabric which do not pill, like cotton does, and is resistant to shrinkage and fading. It gives an ultimate smooth and soft feeling against the skin, these stoles are ideal for any occasion when more than anything a slight warmth or cozyness is required. Wrap it, Drape it or simply wear on one shoulder for a trendy look. These stoles are the best to put on with any garment and during any season. Extremely light to carry, these stoles can be easily folded and couched in your purse when not required. A must buy for every women. A vintage Striped Print and Abstract Design highlight this stylish Multicolor Reversible Silk Stole. This Pure Kashmiri lightweight Stole is finished with fringed edges which gives a great look to the stole. This stole is made from Modal Silk Fabric which do not pill, like cotton does, and is resistant to shrinkage and fading. These stoles are the best to put on with any garment and during any season. Extremely light to carry, these stoles can be easily folded and couched in your purse when not required. A must buy for every women. A stunning Paisley Pattern Multicolor Wool Blended Modal Silk Kashmiri Reversible Stole with Chequered Design. This Glossy Finish Stole is all over printed with Paisley and Chequered design with leafy design border. The stole is tasseled for that fun feel and it gives a great look to the stole. This stole is made from Modal Silk Fabric which do not pill, like cotton does, and is resistant to shrinkage and fading. It gives an ultimate smooth and soft feeling against the skin, these stoles are ideal for any occasion when more than anything a slight warmth or cozyness is required. Wrap it, Drape it or simply wear on one shoulder for a trendy look. These stoles are the best to put on with any garment and during any season. Extremely light to carry, these stoles can be easily folded and couched in your purse when not required. A must buy for every women. Beautiful Checkered Shawl with Classic Looks of 1970s and 80s: This shawl in multi-color big block design is for stylish person like you. The checkers style gives you the looks of the good old days of 70s and 80s, which is now on hep again. It is soft and comfortable to the skin. It is long enough to wrap two-three times on your neck to be a cute scarf. You will love its versatility and soft texture. It is blended with Silk and Wool ruffle yarn to produce cost effective product. This beautiful Cream Hand Embroidered Pure Kashmiri Wool Shawl would definitely compliment your feminine beauty. This delicate Kashmiri shawl comes with heavy Kullu Floral Embroidery all over the Shawl which makes it a master piece of craftsmenship. The shawl is tasseled for that fun feel and its gives a great look to it. It gives an ultimate smooth and soft feeling against the skin, these Shawls are ideal for any occasion when more than anything a slight warmth or cozyness is required. Wrap it, drape it or simply wear on one shoulder for a trendy look. These shawls are the best to put on with any garment. Extremely light to carry, these shawls can be easily folded and couched in your purse when not required. A must buy for every women. Colourful Multicolor Shawl in Pure Kashmiri Cashmilon: This fabulous shawl in multi-color Floral pattern with all-over fine floral embroidery is for a stylish person like you. It is blended with Cashmilon and Wool ruffle yarn to produce cost effective product. The yarn used is very soft against the skin. Light weight and very warm, gives you look and feel of 100% Kashmiri Shawl. Get this beautiful Reversible Multicolor Kashmiri Silk Stole which comes with attractive Stripes Pattern all over the stole in Glossy Finish. The stole is tasseled for that fun feel and its gives a great look to the stole. This stole is made from Modal Silk Fabric which do not pill, like cotton does, and is resistant to shrinkage and fading. It gives an ultimate smooth and soft feeling against the skin, these stoles are ideal for any occasion when more than anything a slight warmth or cozyness is required. Wrap it, drape it or simply wear on one shoulder for a trendy look. These stoles are the best to put on with any garment and during any season. Extremely light to carry, these stoles can be easily folded and couched in your purse when not required. A must buy for every women. Rajasthani Bandhej Design looks amazing! Light up your personality by wearing this incredible bandhej print Blue and Orange color Dupatta . This Dupatta is in enticing Blue-Orange color duo with Sequin work, Mirror work. The Dupatta comes with Shell work along with the silver color bead continuation on the border. This stunning look Dupatta is 225 cm long and 110 cm wide. Buy this Lovely Dupatta here at the best price. 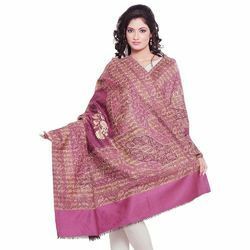 Square Pattern Design Kashmiri Shawl:This Light Brown Cashmilon Kashmiri Shawl with square pattern design is to compliment your feminine beauty. The fine embroidery on borders makes it a designer one.The yarn used is very soft against the skin. Light weight and very warm, gives you look and feel of 100% Kashmiri Shawl. Wrap yourself up in style with this Wool Blended Cashmilon Pure Kashmiri Pink Shawl, ideal for layering over your favorite winter knits. 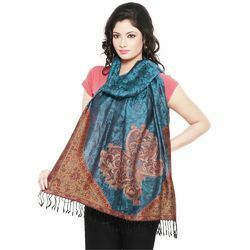 This soft Wool Cashmilon blend shawl comes with attractive Floral and Paisley Design along with Traditional Resham Thread Work which makes it a great accent to almost any ensemble. The shawl is tasseled for that fun feel and its gives a great look to it. It gives an ultimate smooth and soft feeling against the skin, these Shawls are ideal for any occasion when more than anything a slight warmth or cozyness is required. Wrap it, drape it or simply wear on one shoulder for a trendy look. These shawls are the best to put on with any garment. Extremely light to carry, these shawls can be easily folded and couched in your purse when not required. A must buy for every women. No other piece of accessory can work double time by offering your ensemble a directional finish while keeping you feeling comfy like this humble Pure Kashmiri Reversible Stole can. This Light Purple Silk Stole has intricate Abstract Pattern all over that adds an artsy flair to your everyday dressing. The stole is tasseled for that fun feel and its gives a great look to the stole. This stole is made from Modal Silk Fabric which do not pill, like cotton does, and is resistant to shrinkage and fading. These stoles are the best to put on with any garment and during any season. Extremely light to carry, these stoles can be easily folded and couched in your purse when not required. A must buy for every women. Beautiful Black and White Stole from the Rare Kashmiri Collection: This stole in black and white square block pattern with printed booties and floral designs. The yarn used is very soft against your skin. It is blended with Silk and Wool ruffle yarn to produce cost effective product. Gorgeous all over Floral Booties and Paisley Designs on sides style the length of this elegant and fashionable Pure Kashmiri Blue Cashmilon Shawl. It is blended with Cashmilon and Wool ruffle yarn to produce cost effective product.The shawl is tasseled for that fun feel and its gives a great look to it. It gives an ultimate smooth and soft feeling against the skin, these Shawls are ideal for any occasion when more than anything a slight warmth or cozyness is required. Wrap it, drape it or simply wear on one shoulder for a trendy look. These shawls are the best to put on with any garment. Extremely light to carry, these shawls can be easily folded and couched in your purse when not required. A must buy for every women. Soft and Sober Kashmiri Stole in Kashmiri Wool: This fabulous Kashmiri stole in beige color is for stylish person like you. The yarn used is very soft against the skin. It is blended with Silk and Wool ruffle yarn to produce cost effective product. Beautiful Paisley Design Feather Weight Jamawar Stole in Pure Kashmiri Wool: This bright red-maroon stole with fine zari Hand embroidery on traditional Bootie and Paisley design all over is very eye pleasing. The yarn used is very soft against the skin. Light weight and very warm, gives you look and feel of 100% Kashmiri wool. It is blended with Silk and Wool ruffle yarn to produce cost effective product. This trendy Pure Kashmiri Silk Stole features a sleek exterior and fringed edges. This stylish, lightweight Rama Green Stole comes with attractive Floral and Paisley Design and all over Leafy Jaal Pattern.The stole is tasseled for that fun feel and its gives a great look to the stole. This stole is made from Modal Silk Fabric which do not pill, like cotton does, and is resistant to shrinkage and fading. These stoles are the best to put on with any garment and during any season. Extremely light to carry, these stoles can be easily folded and couched in your purse when not required. A must buy for every women. Traditionally styled Floral, Leafy and Paisley Motifs on this Reversible Kashmiri Silk Stole with brown base makes it a master piece of craftsmenship. The stole is tasseled for that fun feel and its gives a great look to the stole. This stole is made from Modal Silk Fabric which do not pill, like cotton does, and is resistant to shrinkage and fading. It gives an ultimate smooth and soft feeling against the skin, these stoles are ideal for any occasion when more than anything a slight warmth or cozyness is required. Wrap it, Drape it or simply wear on one shoulder for a trendy look. These stoles are the best to put on with any garment and during any season. Extremely light to carry, these stoles can be easily folded and couched in your purse when not required. A must buy for every women. The elegant texture of this Black and Brown Wool Blended Pure Kashmiri Cashmilon Shawl comes through with Hand Embroidered Floral Jaal Pattern and attractive Bootie Designs. It is blended with Cashmilon and Wool ruffle yarn to produce cost effective product.The shawl is tasseled for that fun feel and can be worn from both sides. It gives an ultimate smooth and soft feeling against the skin, these Shawls are ideal for any occasion when more than anything a slight warmth or cozyness is required. Wrap it, drape it or simply wear on one shoulder for a trendy look. These shawls are the best to put on with any garment. Extremely light to carry, these shawls can be easily folded and couched in your purse when not required. A must buy for every women. Kashmiri Designer Deep Purple Woolen Stole Wrap: This classic Stole in deep purple color is for tasteful person like you. The yarn used is very soft against the skin. It is blended with Silk and Wool ruffle yarn to produce cost effective product. Fine Floral Embroidery Kashmiri Shawl: This white Kashmiri Shawl with heavy Kullu embroidery on borders in floral pattern is to compliment your feminine beauty. The fine hand embroidery on borders makes it a designer one. It is blended with Silk and Wool ruffle yarn to produce cost effective product. This fabulous Kashmiri Light Brown Shawl with Embroidered Border is for stylish person like you. The yarn used is very soft against the skin. Light weight and very warm, gives you look and feel of 100% Kashmiri Shawl. Get Flower Power with this Reversible Multicolor Kashmiri Silk Stole with Flower and Paisley Print which gives it a classic look. The stole is tasseled for that fun feel and its gives a great look to the stole. This stole is made from Modal Silk Fabric which do not pill, like cotton does, and is resistant to shrinkage and fading. It gives an ultimate smooth and soft feeling against the skin, these stoles are ideal for any occasion when more than anything a slight warmth or cozyness is required. Wrap it, Drape it or simply wear on one shoulder for a trendy look. These stoles are the best to put on with any garment and during any season. Extremely light to carry, these stoles can be easily folded and couched in your purse when not required. A must buy for every women. This fabulous Chequered Style Reversible Kashmiri Silk Grey Stole with all-over printed Circular and Square designs in big square blocks is for a stylish person like you. The stole is tasseled for that fun feel and its gives a great look to the stole. This stole is made from Modal Silk Fabric which do not pill, like cotton does, and is resistant to shrinkage and fading. It gives an ultimate smooth and soft feeling against the skin, these stoles are ideal for any occasion when more than anything a slight warmth or cozyness is required. Wrap it, Drape it or simply wear on one shoulder for a trendy look. These stoles are the best to put on with any garment and during any season. Extremely light to carry, these stoles can be easily folded and couched in your purse when not required. A must buy for every women. Traditionally styled and Handcrafted this Pure Kashmiri Wool Shawl with White Floral Embroidery over Black base makes it a master piece of craftsmenship. The Shawl is tasseled for that fun feel and its gives a great look to it. These Shawls are the best to put on with any garment. Extremely light to carry, these shawls can be easily folded and couched in your purse when not required. A must buy for every women. Get Wrapped in this beautiful piece of clothing to complement your casual attire with true indulgence of panache. Flaunting an appealing shade of Magenta and Brick Red, this Pure Kashmiri Reversible Silk Stole has all those style elements to keep you stylish and in fashion at all times. Crafted from Modal Silk Fabric, this stole do not pill, like cotton does, and is resistant to shrinkage and fading. The Floral Designs all over the stole up your glam quotient wherever you go. Extremely light to carry, these stoles can be easily folded and couched in your purse when not required. A must buy for every women. Traditional design dupatta with intricate bandhej design on cotton fabric in fancy color, sourced from Jaipur, Rajasthan in India. They serve as an added attraction to the casual wear or indian wear, this dupatta is in stunning Brown-Beige colour combination. This Dupatta has Mirror, Sequin and Shell work along with silver color bead continuation on the border. This amazing look Dupatta is 225 cm long and 110 cm wide. Shop this designer and Dupatta here at the best price. Bandhej print design looks amazing! Light up your personality by wearing this incredible bandhej print Tri-color Rajasthani Dupatta. This Dupatta is in enticing Green-Yellow-Pink color trio with Sequin work, Mirror work. The Dupatta comes with Shell work along with the silver color bead continuation on the border. This stunning look Dupatta is 225 cm long and 110 cm wide. Buy this Lovely Dupatta here at the best price. This Rajasthani Red Dupatta with Sequin work impresses at the first sight. This is made from cotton fabric in Red color with bandhej print all over. The shell work along with the silver color beads continuation on the border gives a very traditional ethnic look to the Dupatta and the mirror work creates a great charisma. This amazing look Dupatta is 225 cm long and 110 cm wide. Buy this attractive Dupatta here at the best price. Simple and elegant this Blue-Turquoise cotton Dupatta features eye-catching shell work along with silver color bead continuation on the border. This Rajasthani design Dupatta has mirror work and amazing sequin work too. This stunning look Dupatta is 225 cm long and 110 cm wide. Buy this extraordinary Dupatta here at the best price. The timeless look you will absolutely fall in love with, this Dupatta is in magnificent Green-Yellow color duo with Sequin and Mirror work. The Dupatta comes with Rajasthani Shell work along with the silver color bead continuation on the border. This amazing look Dupatta is 225 cm long and 110 cm wide. Buy this fashionable Dupatta here at the best price. The Gorgeous look you always wanted to have, this ethnic design Rajasthani Dupatta is in magnificent Brown-Red color duo with Sequin work, Mirror work. This bandhej Dupatta comes with Shell work along with the silver color bead continuation on the border. This amazing look Dupatta is 225 cm long and 110 cm wide. Purchase this fashionable Dupatta here at the best price. A stylish Black Dupatta with Sequin work impresses at the first sight. This is made from cotton fabric in Black color with bandhej print all over. The shell work along with the silver color beads continuation on the border gives a very traditional look to the Dupatta and the mirror work creates a great charisma. This amazing look Dupatta is 225 cm long and 110 cm wide. Buy this attractive Dupatta here at the best price. Dupattas are very popular in the Rajasthani fashion market. This Dupatta has Mirror Work, Sequin Work, Shell Work along with silver color bead continuation on the border. They serve as an added attraction to the casual wear such as Jeans, T-Shirt, Skirt and Kurtis. This dupatta is in dual colour combination of Orange and Red. This amazing look Dupatta is 225 cm long and 110 cm wide. Shop this designer and Dupatta here at the best price.